WWE calls Night of Champions the one night that "every championship in WWE is guaranteed to be up for grabs." While the tagline sounds great, that marketing ploy doesn't make this pay-per-view any different than many others held by the company. However, there is something that will help the 2015 edition of Night of Champions go down in the record books. It will be the first time that the legend known as Sting will compete for WWE gold. As announced following the August 24 episode of Raw, the former WCW and TNA champion will battle Seth Rollins for the WWE World Heavyweight Championship at Night of Champions. It's one of three title matches booked so far, and there's still nearly three weeks to go until the event kicks off at Houston's Toyota Center. Between the gold that will be up for grabs and continuing storylines from last month's SummerSlam, WWE fans will have plenty to get excited about by the time Night of Champions rolls around on Sunday, September 20. Seth Rollins is literally facing everybody heading into Night of Champions. Rollins is booked to defend the World Heavyweight Championship against Sting. He'll also face John Cena in a rematch for the United States Championship. Plus, as the WWE Universe saw on Raw last night, he has verbally challenged Triple H's legacy inside the squared circle. Only Rollins could convincingly pull off headlining three separate storylines. He is a perfect character, mixing a smug demeanor with superior in-ring ability. 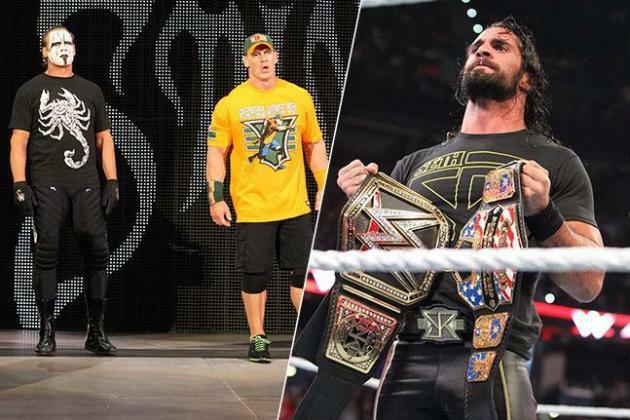 Since beginning his feud with Cena prior to SummerSlam, Rollins has been on fire. Even his promos are crisper and pointed, with an added ferocity.